The 2018 Kia Optima is an optimal vehicle for families on the go. This mid-size sedan is practical, powerful, and fun. For an exciting ride, up-to-date technology features, and appealing style consider the 2018 Optima as your next family sedan. The base trim level of the 2018 Kia Optima is powered by a 2.4-liter engine, paired with a six-speed automatic transmission. The responsive and smooth feel of the transmission and the exciting and boastful power of the engine make the perfect combination for adventurous daily drivers. The engine and transmission pairing of the 2018 Kia Optima is sure to please the driver, but any head-of-household knows that a family sedan must accommodate the kids as well. That’s why the 2018 Optima is available with excellent audio and infotainment features. Find Kia’s UVO infotainment system in the Optima, which is easy to use thanks to the 7-inch standard touchscreen, or available 8-inch touchscreen. This 2018 Kia sedan even comes standard with Apple CarPlay and Android Auto, so individuals can pair their smartphone with the vehicle’s infotainment system to make hands-free phone calls, access navigation, and stream music. 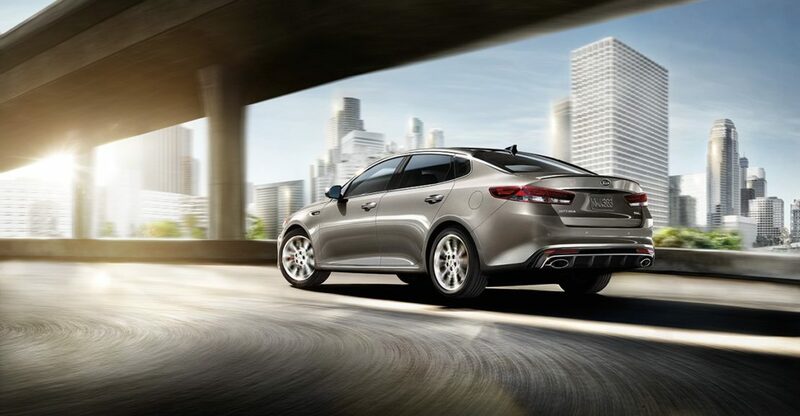 Want to turn heads in the family sedan? Stand out from the other cars in the school parking lot with the 2018 Kia Optima. This vehicle has sporty design elements throughout the exterior, including a sleek mesh grille, striking headlights and taillights, and swooping curves. If you’re interested in the 2018 Kia Optima, come visit us at New York Autobrokers. Our friendly, experienced, and professional staff can assist car buyers in the sales, leasing, and finance aspect of the car buying process. To learn more about our company, feel free to give us a call at 631-446-4455. You can also visit our location at 320 E Main Street in Long Island.